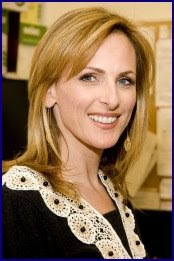 HOLLYWOOD — Marlee Matlin will receive the 2,383rd star on the Hollywood Walk of Fame May 6, honoring an extensive television and movie career, including being the youngest winner of the best actress Academy Award. Actor-producer Henry Winkler and Anne Sweeney, president of Disney-ABC Television Group, will join Matlin in speaking in the ceremony in front of the Musso & Frank Grill on Hollywood Boulevard, the Hollywood Chamber of Commerce, which administers the Walk of Fame, announced April 27. The ceremony will also include children from the Northbrook, Ill.-based International Center of Deafness & the Arts performing a song. Matlin, who lost all hearing in her right ear and 80 percent of the hearing in her left ear at the age of 18 months because of roseola infantum, made her stage debut in the 1974 at the age of seven in the center’s production of “The Wizard of Oz,’’ as Dorothy. She continued to appear with its children’s theatre group throughout her childhood. The 43-year-old Matlin will receive the star three weeks after the publication of her autobiography, “I’ll Scream Later” and a day before she will receive the Mary Pickford Award at the Hollywood Chamber of Commerce Community Foundation’s 16th annual Women of Distinction luncheon. Matlin was then cast in the film version, which premiered in 1986, winning the best actress Oscar at the age of 21, the youngest to win the award and one of the few performers to win an Oscar in a film debut. Matlin also has an extensive list of television credits, including starring in the 1991-93 NBC crime drama, “Reasonable Doubts” and was a cast member of Showtime’s “The L Word’’ for its final three seasons. From The Cleveland Plain-Dealer. In the picture, Barbara Leadbetter and her daughter, Teela Kelly, 12, read outside their home. Leadbetter is among many parents who have asked Legal Aid for help in getting special-education services from the Cleveland schools. CLEVELAND — Doctors and lawyers are double-teaming the Cleveland schools' special-education office. MetroHealth Medical Center pediatricians who suspect that their low-income patients suffer from learning disabilities are referring families to Legal Aid lawyers with offices in the hospital and three neighborhood health centers. The lawyers then pressure the school district to provide what can be costly services. The collaboration, known as the Community Advocacy Program, began in 2002 but gained momentum as it added sites and attorneys. The advocacy program took on 117 special-education and other school cases last year, up from 37 in 2006. Up to three-fourths of the cases involved the Cleveland schools. "It's jumped tremendously," said Robert Walsh, the Cleveland district's executive director of special education. Walsh said he added an employee this school year just to help with the volume. Demand also has swamped the three Legal Aid education lawyers, forcing two to temporarily stop taking new cases early this year. Cleveland's alliance, underwritten by the United Way, foundations and law firms, was one of the first in the country, said Ellen Lawton, executive director of the Boston-based National Center for Medical-Legal Partnerships. Such cooperation now exists in 80 cities, Lawton said. The Community Advocacy Program helps poor people of all ages with a variety of legal issues that pile up and make it hard to lead healthy, productive lives. Special education is probably the No. 1 concern, but lawyers also handle tasks such as appealing denial of Medicaid eligibility, and hounding landlords to clean up mold and lead paint. Legal Aid also takes on suburban and charter schools, but the Cleveland district, because of its size and poverty, generates most of the partnership's special-education cases. The number of district students in special education has remained steady, but the percentage has climbed as other children abandoned the city's public schools. Nearly one in five Cleveland students gets customized attention for all or part of the day, compared with less than 15 percent statewide. MetroHealth's pediatricians watch for signs of disability during checkups. If doctors detect problems in intellectual development or behavior, they write referrals for legal counsel. "When a child comes to see the doctor, the first question is, 'How are things going at school?' " said Legal Aid lawyer Mallory Curran, who keeps hours two days a week on a MetroHealth pediatrics floor. "The medical doctors are such good screeners." Curran proposed the program after learning of a similar setup in Boston. MetroHealth pediatrician Robert Needlman said doctors welcomed assistance with legal issues for which they have neither time nor expertise. The school bureaucracy can intimidate parents who often have their own learning disabilities, Needlman said. He said parents may simply go along when schools write off their sons and daughters as "bad kids." "If the child had cancer, there'd be all sorts of help," Needlman said. "If your child has dyslexia or ADHD [attention-deficit hyperactivity disorder] or any behavior-type problem, you're likely to get blame or you're likely to blame yourself." Students whose emotional problems go undiagnosed may face repeated suspension from school, said Vanessa Coterel, a Legal Aid lawyer who works with doctors at Nationwide Children's Hospital in Columbus. She knows of parents who lost jobs, and ultimately homes, because they had to constantly leave work to pick up children in trouble. Curran said Legal Aid and the district have typically settled cases, though a few have gone to mediation. Solutions vary. In some cases, the district agrees to have speech pathologists work with children who understand questions but can't quickly put their responses into words. At other times, officials might provide busing for mentally retarded students who cannot walk safely to school on their own. Curran said the district special-education operation is capable but often acts slowly or resists changing students' individual plans. The district is not unique in that regard. In a survey of parents taken last year, a statewide medical-legal task force found that more than 25 percent of children had waited longer than six months for services to start and more than one in six waited longer than a year. Barbara Leadbetter turned to Legal Aid more than four years ago. She said her daughter, Teela Kelly, then 7, suffered from seizures, ADHD and speech problems, but except for an hour of tutoring, she remained in regular classes at her Cleveland elementary school all day. After appealing unsuccessfully to the principal for three or four months, Leadbetter turned to Legal Aid. Curran arranged a meeting with district officials and got Teela into smaller disabled-only classes. "They weren't listening to me," Leadbetter said. "Just her presence alone changed everything." Walsh said the district bases its decisions on what's best for each student, but special education has become increasingly expensive for all school systems. Cleveland spent $23,100 per special-education student last year, about $10,000 more than the average for all students. The district has about 600 students in private day treatment or residential programs that can cost up to $80,000 a year for one child. Walsh and Curran said, if possible, they try to keep children in city schools, a choice encouraged by federal and state law. Walsh blamed some of the disputes with families on miscommunication. For example, he said, administrators and teachers might mistakenly tell parents that their schools cannot provide certain services. "Sometimes, as a district, we shoot ourselves in the foot," Walsh said. "We're educating our staff as we go along." From The Washington Post. In the picture, Karen Kaye-Beall and Eddie Atanasoff, right, help Kaye-Beall's son, Tyler, use a communication device to indicate he wants a doughnut. Imagine feeling ill and being unable to tell anyone what hurts. Or longing for pizza on your eighth birthday but ending up with Chinese takeout because you couldn't explain what you wanted. These are the kinds of frustrations, experts say, that are faced by the more than 1 in 150 children in the United States who have a diagnosis of autism. The solution to some of those problems could be the push of a button away. A set of aids -- ranging from simple, notebook-size plastic boxes to more sophisticated devices that resemble a clunky BlackBerry -- has been developed to help those with autism express their needs. The devices range in price from about $100 to several thousand dollars. Many are designed to be portable and the simpler ones are also nearly indestructible, a key advantage for children who may rock in a seat against a backpack or are prone to throwing things. Karen Kaye-Beall, a mother of two children with autism, became interested in so-called augmentative devices for their ability to increase the communication skills of her son, Tyler, who is 15. The director of an autism support center in suburban Maryland, Kaye-Beall has created a small showroom in her Montgomery County home where people can test the devices and find what best suits their family's needs. The simplest model looks like a toy with picture cards, depicting food, health and daily activities, that slide in and out. Press one of the 12 buttons beneath a picture and the device voices a simple sentence. Children who have gained some skill with a keyboard can graduate to computer-based applications with a much wider range of data and picture choices. Parents can also enter information about a child for other adults to use in case he or she gets lost or needs help. Although some parents fear that the use of such devices may discourage their children from trying to speak, Rebecca Landa, director of the Center for Autism and Related Disorders at Kennedy Krieger Institute in Baltimore, says that she hopes to dispel that worry. "If a child is going to speak," she says, "they are going to use all means possible to get there." She argues instead that the devices may facilitate the acquisition of speech. Hearing a phrase spoken aloud may also help them to eventually say it themselves. Kaye-Beall explains that children begin to use the devices "like a road map from thought to expression, allowing for more spontaneous speech." She says her son has been using a device for the past month, and "his spontaneous functional speech has increased noticeably." The one drawback, according to Pam Mathy, also of the Kennedy Kreiger Institute, is that speech pathologists who evaluate children may not be familiar with the devices and therefore lack the expertise to fit a child with the right one. Parents may need to take the initiative researching the right fit for their child. From the intro to a story in the Oak Hill Gazette in Austin, Texas. In the picture, Sophia Perdichizzi, (left ), Cody Pedneau and Matthew Fain, (right), explore the new technology which will be offered next year at The Worthy School of Austin, a school for children with dyslexia. There were early signs when Cody Pedneau was in pre-kindergarten class, but by the time he hit kindergarten it became very obvious that school was really tough for him. "In preschool, when kids were supposed to be picking up rhyming and letter recognition, Cody wasn't picking up the foundational reading skills that many kids have at that age. Cody was diagnosed with dyslexia in kindergarten. It was a really hard time for our family," said his mom, Randa Pedneau. "Cody thought he was dumb and his self-esteem was low as a result. It was hard for him because his older brother is a little bit advanced and Cody would compare himself to his brother. As a parent of a dyslexic child, you ache for them," she added. Pedneau, who has a business degree and teacher certification, became a private dyslexia therapist after learning about Cody's situation. "I have always had my hand in education, and with dyslexia, it is so crucial to get help early on. It can totally change the child's world." Cody is now in the fifth grade at Rawson-Saunders, which is a specialized school for dyslexic children. "It is hard to be the mom and his therapist, it didn't work well for us, so it was better for him to attend a school that specializes in this," said Pedneau. She has two other children, a first-grader at Clayton Elementary and a seventh-grader, who will be attending Gorizcky Middle School in the fall. Cody, who is in fifth-grade, added: "I don't like being dyslexic a bit. Reading is a lot harder and it is not very fun. I like to skateboard and go to the skateboarding parks around town. You have to go early when it is not so crowded." His mom said he can do some pretty good tricks. "I think it must be very freeing for him," she added. Between 15% and 20% of the population has mild to severe dyslexia. As defined by the International Dyslexia Association (IDA): "Dyslexia is a language-based learning disability. Dyslexia refers to a cluster of symptoms, which result in people having difficulties with specific language skills, particularly reading. Students with dyslexia usually experience difficulties with other language skills such as spelling, writing, and pronouncing words. It affects individuals throughout their lives; however, its impact can change at different stages in a person's life. It is referred to as a learning disability because dyslexia can make it very difficult for a student to succeed academically in the typical instructional environment." The IDA continues: "The exact causes of dyslexia are still not completely clear, but anatomical and brain imagery studies show differences in the way the brain of a dyslexic person develops and functions. Moreover, most people with dyslexia have been found to have problems with identifying the separate speech sounds within a word and/or learning how letters represent those sounds, a key factor in their reading difficulties. Dyslexia is not due to either lack of intelligence or desire to learn." The Web site states that dyslexia is not about reversing letters. Many dyslexics display insightful, impressive talents for thinking outside of the box. "You have to be smart to be dyslexic, because of the 'decoding' methods that take place for dyslexic students to read and write," added Pedneau. Some of the early indicators of dyslexia include difficulties in acquiring and using language, such as rhyming and letter recognition at the pre-school age, which are foundational skills for reading. Talking later than expected and slowness to add new words can be another early indicator for children under seven. By first and second grade, there may be no understanding of how to put letter sounds together or fluency in reading. Spelling and reading are affected, as well as doing math operations, such as remembering sequences, like counting to twenty. Now, with her husband Mike, the Pedneau's are starting up The Worthy School of Austin, which will open in the fall of 2009 to incoming sixth graders. "We are starting this school, almost out of necessity. It is our goal to empower these kids to know that they are worthy – worthy to learn, worthy to succeed, worthy to go to college or pursue their dreams, worthy to become anything they want," Randa Pedneau explained. "We want to integrate the available technology and there is currently no school nearby that does this. We are starting off with sixth grade first and want to have our program to be as good as possible before we start adding grades. Our plan is to add grades seven and eight the following year. Beyond that we will add grades each year to become a full secondary school offering grades sixth through twelve ultimately," she added. Among the founding families is the principal of the School for the Blind, Miles Fain. In addition, former teachers, an engineer, a motivational speaker, and a dyslexia specialist are also helping set up the school. "A person doesn't usually start up a school like this for fun, but we just felt it was so needed and so important. We have some really great people to help us start this up. One of our goals is to keep the curriculum more consistently at grade level to prepare these kids for college," added Pedneau. At this time, there is no secondary school in Austin for children overcoming dyslexia. The Rawson-Saunders School, located on Exposition Boulevard in Austin, offers a specialized curriculum for dyslexic children for students in grades first through eighth. In some cases, a lot of college students spend their Sundays sleeping-in after a Saturday night out. But this week, a group of 10 student mentors spent an afternoon with young adults with autism. 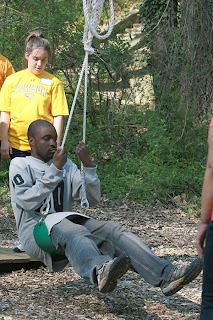 The young adults came to TU to participate in the Autism Challenge Course sponsored by the Center for Adults with Autism Spectrum Disorder from surrounding areas like Baltimore and Bethesda. “The idea is for these folks to learn social communication skills, social interaction skills and to do it in a formal environment,” Karen Pottash, speech language clinical administrator, said. Pottash is the challenge course’s on-site supervisor. The program, which took place in the Glen Woods, consisted of a series of activities in order to enhance participants’ social skills. For all activities, the mentors and their mentees were broken up into a black team and a gold team. Communication and leadership were key objectives, according to Giles. Justin Williams, 23, was the leader of his group for the “Island” activity. He decided when people would approach land, in what order and how they would go about it. His mother, Claudette Williams, wanted her son to participate so he can socialize with others. He hasn’t been involved with any social groups since he graduated high school, according to Claudette. According to Claudette, Justin wants to take college classes and this course is allowing his mother to determine if he’s ready to hold his attention for a period of time. “I liked working together and being the leader,” Justin said. Sarah Camponeschi, a speech pathology graduate student, was Justin’s mentor. She’s worked with children with autism but wanted to see what it would be like to work with young adults. Freshman psychology major Emily Snyder has never experienced working with children or adults with autism. Pottash said at the beginning of the afternoon that it was everyone’s goal to meet at least one new person and know at least two things about him or her. Daniel Hecht, 21 and Snyder’s mentee, fulfilled his goal. He became friends with Justin. “He was very nice,” Hecht said. of Hartford announced April 27 it will start a new master's program in orthotics and prosthetics. The university will train students to assess and treat patients through physical therapy and teach them about the design and operation of orthotics and prosthetics in biomedical engineering classes. The supportive devices have evolved dramatically over the years, with knees controlled by microprocessors, braces outfitted with Bluetooth devices that can send signals to nerves and prosthetic hands covered in a material that looks like human skin.With 9.7 million patients expected to need orthotics or artificial limbs by 2020, the American Academy of Orthotists and Prosthetists is campaigning to increase the number of students entering the profession. The university will partner with the Newington Certificate Program in Orthotics and Prosthetics to offer the program at both locations.The university currently offers a certificate in the field, but because the field is developing so quickly and broadly, the National Commission on Orthotic/Prosthetic Education now requires certificate programs to be elevated to a master's degree level by 2012. The program will offer students two paths toward a master's degree. They can take the traditional route, earning the two-year master's of science after completing a bachelor's in health science, or they can enroll in a "three-plus-two" program that allows sophomores to earn their bachelor's and master's degrees together in five years. In both cases, students must also do a two-year residency. Graduates can expect to earn $40,000 to $60,000 a year upon completing their residency, depending on the region and facility, said Matthew Parente, associate director of the program. University of Hartford student Ryan Cline, 23, of Lee's Summit, Mo., is currently in the certificate program and is eager to earn his master's. An amputee himself, he played lacrosse and baseball in school and hopes to inspire his patients. "I feel that my experiences can help others succeed," Cline said. Reporting from Chicago -- Researchers have found that many people with autism share common genetic variations, a discovery that may improve diagnosis and offers the promise of developing treatments for the frustratingly mysterious disorder. Their findings, published in the journal Nature, compared the genomes of thousands of autistic people with those of thousands of people without the disorder -- a massive task that new technology has only recently made possible. The genome is the complex system of DNA coding that builds and runs the human body. The review showed that most autistic people examined have a genetic variation in a portion of their DNA that affects the way brain cells connect with one another. Scientists also reported a link between autism and small "mistakes" in another DNA segment involved with cell communication. Both reports add weight to the idea that autism is related to problems with the way brain cells connect. "It is very exciting," said study leader Hakon Hakonarson, director of the Center for Applied Genomics at Children's Hospital of Philadelphia. "It opens up the opportunity someday for new interventions to fix the bad consequences this variant has on brain function and development." A disorder marked by impaired language and ability to interact, autism affects 1 in 150 children in the U.S., according to the Centers for Disease Control and Prevention. Up to now, the medical community could say very little about what causes autism or how to treat it. The lack of scientific knowledge about autism has led to a proliferation of pseudoscientific explanations for the disorder, as well as unproven treatments. Though this is not the first time geneticists have found a link between autism and DNA, past discoveries have involved extremely rare instances in which a tiny bit of DNA was missing or there were too many copies of another bit. Those differences were helpful in understanding how trouble in those regions of the genome can lead to autistic symptoms, but they accounted for only a tiny fraction of autism cases. By contrast, the new research is "a big step," said Thomas Lehner, chief of the Genomics Research Branch at the National Institute of Mental Health. The first of two Nature studies released April 28 found that 65% of autistic participants shared a variation between cadherin 10 and cadherin 9, a region of the genome that controls cell-adhesion molecules in the brain. Those molecules help brain cells connect, and autism researchers have long suspected that trouble there may be linked to the disorder. The second study suggested a link between autism and an excess of genetic material associated with ubiquitin, a protein involved with connections between cells. The reports also do not explain the rising numbers of diagnosed cases of autism. That increase may be occurring because of heightened awareness, because the definition of autism has expanded, because of some environmental factor, some combination of these factors or something else entirely. Fresno, Calif. -- A different health issue plaguing Fresno County isn't illness but the pay cut facing its in home health care providers on July 1st. And it had many of those workers packed into the Hall of Records for the Board of Supervisors meeting in late April. The subject was a pay cut and the employees like Lisa Brown came away empty handed. She's a single mom and is the in home health care provider for her son Alexander who was born with Down's syndrome. Brown is paid 11 dollars and change an hour for just six hours a day. California reimburses Fresno County for the work she does with state funds. Lisa quit her job to stay home with her son 24 hours a day and said, "Lives depend on this service." When she appeared before the Board on Tuesday she explained whey she chose, "I care for my son who's cognitively disabled. He has Down's syndrome." She added that. "It keeps Alexander at home and out of institutional care." Brown was one of many voices asking the Fresno County Board of Supervisors to make up the state reduction of their hourly wages, arguing federal stimulus money will help pay for it. Reverend Samuel Thompson, himself an in home health care provider joined her, "So we have to take care of 'em and you all have the power and the ability to not cut the wages." institutional care. Linda told Action News why this work is so valuable, "People's very lives are in the hands of these workers who maybe only paid for a couple of hours of care." But with California facing serious budget problems, the state wanted Fresno County to accept cuts to the program by May 1st that will lower wages to ten dollars an hour. No one on the board liked their options. Supervisor Henry Perea noted, "This is just a really difficult situation to be in. I think we could do better. I think we could do different." Supervisor Judy Case agreed but didn't see how at this point, "As much as I and everybody else would like to provide something better, in this economy, everybody's tightening their belt." A three to two vote ended the April 28 debate in Fresno County, which chose to accept the State's reduction in the hourly wage for it's in home health care providers on July 1st. But these union workers say Federal Stimulus dollars can be used to change that plan and vow to keep the pressure on at the State Capitol. Long before her son Michelangelo's first birthday, Dana Commandatore began to suspect he was different. The other babies she knew babbled animatedly to everyone in sight. Michelangelo, though, never took much interest in children his age, and by the time he was 18 months old, he still wasn't speaking. Determined to find out what was wrong, Commandatore took her son to the pediatrician. "They sent us for a hearing test. The technicians were trying to put the headphones on and Michelangelo wouldn't let them do it," she recalls. "One tech said to the other, 'It seems more like autism than a hearing problem.' I turned around and said, 'What?'" When Michelangelo's autism diagnosis was confirmed soon after, the verdict was more of a relief than anything else -- it seemed to suggest a clear course of action. "We knew who he was," Commandatore says. "Now we knew what to do." In the process of scouring the Internet, she stumbled across Web sites run by autistic adults who advocated a school of thought they called "neurodiversity." Autism was not a "disease," their reasoning went, but a "neurological variation" that ought to be as respected as a difference like skin color or sexual orientation. The Centers for Disease Control and Prevention estimates that the prevalence of autism spectrum disorders in the U.S. is about 1 in every 150 8-year-olds. The advocates' core message -- that autistic people should be celebrated for their uniqueness, not aggressively "normalized" -- struck a chord with Commandatore. She began learning more about the movement and went to hear Ari Ne'eman, president of the Autistic Self Advocacy Network, give a lecture. "I am not a person at all who joins groups. I'm not religious," Commandatore says. "But when I found Ari's Web site and saw him speak, he put into words what I had been thinking." Like the deaf culture movement before it, the so-called autistic culture movement continues to gain traction, boasting thousands of adherents among parents, patients and healthcare professionals. And the rhetoric is often as strident as anything out of the deaf-pride movement. As its associated swag -- buttons and T-shirts proclaiming "I am not a puzzle, I am a person" -- suggests, the movement aims to redefine autism as something to be valued and protected, not obliterated. Proponents insist that forcing autistic people to behave like "neurotypicals," a term that borders on insulting, squelches the very qualities that make them unique. "The real ends for autistic people should be quality of life, full access in society, the kinds of things we support and are working for," Ne'eman says. "Parents have been told that the way to approach these things is to support research for a cure, but our belief is that that's not the most effective paradigm." In other words, Jenny McCarthy can go jump off a cliff. While the Hollywood comedian's claims that childhood shots cause autism may be well-intentioned, Ne'eman says, her message has a pernicious and probably untrue implication: If we stopped giving kids "toxic" vaccines, autism wouldn't exist. Not only does this message distract from pragmatic efforts to get autistic kids the social support they need, it implies that autistic children are inherently less valuable than their normal counterparts. "The cure paradigm sends a message that there is somehow a normal person under the autistic person, and that's a significant denial of who we are." But it's not just anti-vaccine diatribes that raise autistic culture crusaders' ire. Their primary target is something much broader and more insidious: the general therapeutic approach to autism in the medical community. Many autistic rights advocates have spoken out against applied behavioral analysis (ABA), the most common type of autism therapy, developed by UCLA psychologist Ivar Lovaas in the 1960s and '70s, with the goal of helping autistic children achieve "normal intellectual and educational" functioning. The therapy, which uses repetition and rewards to reinforce new skills, is geared toward extinguishing autistic behaviors such as "stimming" (making repetitive body movements) and failing to make eye contact. 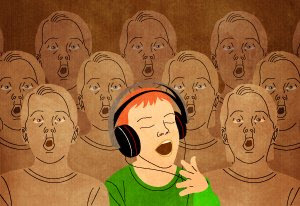 One sign of the treatment's success, Lovaas suggested, might be for school personnel to perceive an autistic child as "indistinguishable" from his or her normal peers. remain autistic throughout his or her lifetime," Seidel says. "And it can be very problematic and a source of stress for an autistic child to have to suppress certain mannerisms." Equally problematic, says Dora Raymaker, a Portland, Ore., artist with autism, is the tendency for medical professionals to impose "normal" behaviors on autistic people -- even when those behaviors do not necessarily improve their ability to function. Rather than undergoing continual and grueling speech therapy, Raymaker has fought to express herself via text chat, the communication medium with which she feels most at home. "If we'd done this interview on the telephone you would have been lucky to get much more than disjointed, stuttering, completely non sequitur responses from me," she told me in an instant-message conversation. "But because you allowed me to do this interview through text-only media where I can slow down, really understand you, and bypass my difficulties with spoken language, I'm able to give you intelligent, on topic answers." The key assumption that underlies much autistic culture discourse is that any autism-related limitations can be worked around and dealt with in a way that does not compromise the autistic individual's core "personhood." When such workarounds are found, Raymaker asserts, the concept of a "cure" becomes irrelevant. "Do I need a pill to make me suddenly able to have phone conversations, or do I need you to be able to find a middle ground that bypasses my disabilities?" Some parents and therapists counter that this kind of active opposition to suppressing autistic symptoms is a niche crusade -- one mounted by a small, visible group of high-functioning autistics who don't represent the autistic population at large. If a child stages screaming outbursts in the classroom or has trouble stringing together a complete sentence, New Brunswick lawyer Harold Doherty argues, does it really make sense to treat that child's condition as "a different neurological way of being," instead of a disease that imposes severe limitations? "Some of these advocates oppose a cure and they appear in court proceedings. In all these cases, they're talking about other people's children," says Doherty, whose son Conor is autistic. "Who gives them the authority to represent autistics? What does Ari Ne'eman know about Conor? He has no real investment in my son's life. There's a denial in this movement of the challenges of more autistic individuals. It's not a feel-good story to talk about kids who are smashing their heads into things." The question of whether autism should be considered a medical condition or a variation in neural wiring isn't just one of semantics. If autistic-rights advocates win their court battles, many treatment programs could stop receiving government money. In 2004, for instance, autistic-rights crusader Michelle Dawson convinced the Canadian Supreme Court to overturn an appeal that would have provided state funding for ABA therapy. If similar legal efforts succeed in the U.S., says Massachusetts psychologist Teresa Bolick, autistic children could be hampered in acquiring the skills they need to interact with the world. "One of the main dangers of saying, 'This is not a developmental disorder,' is that federal and state governments don't usually fund intervention for differences," Bolick says. "Parents say, 'But what if his natural personality is to be a hermit? What if my son just wants to be like Thoreau?' I say, 'You know what, if he wants to be Thoreau, that's terrific.' But we need to give people the skills so they can choose whether to be like Thoreau or like a more social person." Bolick adds that the justification many autistic culture advocates give for slamming ABA -- that the therapy is condescending and attempts to turn autistic children into people they're not -- is strained and largely outmoded. "If we look at contemporary ABA, we see tremendous attention to the individual and tremendous appreciation for personality," she says. "Old-fashioned behavior modification has the reputation of using aversives and denying individual freedoms, but that's not the way good treatments are anymore. For the most part, reinforcement is driven by what the kid wants to do. One kid loves it when his teaching assistant draws for him, so he'll do anything if she'll draw." Ne'eman disputes the accuracy of this portrayal, citing cases in which autistic children were abused and restrained in the name of "therapy." "There are very significant problems with the way in which intervention is approached," he says. "The founders of ABA quite unabashedly practiced the use of aversives, including electric shock, and this is something that continues to this day." is completely out of sync with the rest of our world. I guess what I'm saying is, it's complicated. Is there something wrong with him or something wrong with society or both?" In theory, neurodiversity advocates fall squarely into the something-wrong-with-society camp. The problem isn't that they or their children are defective, their thinking goes, but that society simply isn't capable yet of giving them the accommodations they need. In practice, though, many pro-neurodiversity families take a more nuanced stance on therapy and treatment than heated message-board debates might suggest. Safeguarding a child's dignity and teaching him to navigate a neurotypical world, they reason, don't have to be mutually exclusive. "Michelangelo has had a form of ABA three times a week," Commandatore says, "but it is so loose and we control and guide it. We just say, 'Look, we don't stop any stimming behavior.' But that doesn't mean you let him do whatever he wants. If he's stimming and hurting something, you have to stop that. You have to realize what is important and what isn't." singing performance. "He was nervous. He said, 'Mama, I don't want to sing.'" Rather than making her son practice the songs over and over until they became rote, as some therapists might recommend, Commandatore decided to give him a choice. "I said, 'Look, if you don't want to try this, you don't have to. I just want you to go up there and stand with your friends, and remember that Mama and Papa love you and we will be here for you.'" Though Michelangelo was skeptical, he agreed to give it a shot. When it came time for his moment in the limelight, he closed his eyes and took a deep breath. A smile slowly spread across his face as he burst into song. The city is poised to pay $92,000 to settle a lawsuit brought by two wheelchair-bound men who got stranded outside the Powell Street Muni and BART station when a city-owned elevator was turned off. Dennis Herrera said, "and the city has to make sure it never happens again." The lawsuit that Robert Cruz, 61, and Darwin Dias, 75, filed in U.S. District Court alleges violations of the Americans With Disabilities Act. It also reads like a scathing indictment of city services. Cruz and Dias, both in motorized wheelchairs, say they took an elevator down from street level to meet friends at Cable Car Coffee in Hallidie Plaza on May 26, 2007. It was a Saturday at about 2:45 p.m. When their friends left via BART, Cruz and Dias went to the elevator at about 4 p.m., only to find it shut off, their lawsuit says. A sign above the elevator said it only operates until 3 p.m. on weekends. The two men found themselves trapped, facing 20 stairs up to street level and six stairs down to the station. Cable Car Coffee staff? No help. Two police officers who happened by? They suggested Cruz, in need of relief, urinate in a corner gutter. Muni service line? Not our elevator, call the Department of Public Works. DPW? There's only one key to that elevator and the guy who has it left for Memorial Day weekend. There's no way to contact him. The Police Department? Call the Fire Department. Finally some help. Firefighters arrive, carry the wheelchairs down six stairs to the station, where the men can take an elevator. The upshot? The Board of Supervisors' Rules Committee has recommended taxpayers pony up $92,000, something the whole board is to vote on April 28. From The Philadelphia Inquirer. Here's the story from last summer. The mother of a 14-year-old girl who starved to death while under city supervision will "accept responsibility" for the crime and plead guilty to third-degree murder charges, her attorney said April 28. Andrea Kelly, 39, will agree to serve 20 to 40 years in prison for the 2006 death of her daughter, Danieal, (pictured) said lawyer Richard Quinton Hark. The girl, who suffered from cerebral palsy, weighed just 46 pounds when she died in a sweltering apartment. Her legs looked liked bare bone and her back was full of gaping bedsores infested with maggots. Danieal's death and other failures by Philadelphia's Department of Human Services resulted in nine indictments, the firing of the agency's two top officials and a number of reforms at the agency. Hark said Kelly was acknowledging her failures as a parent. "It's a very difficult time when you have to accept responsibility for starving your daughter to death," Hark said. The girl's slow death happened while the family, which included 10 children, was under the supervision of DHS. Prosecutors say the DHS caseworkers failed to do their jobs, which was to protect the child from neglect. The agency had hired a private social services agency, Multi-Ethnic Behavioral Health, to visit the home and make sure the Kelly children were being cared for. Charges of involuntary manslaughter are still pending against a caseworker from Multi-Ethnic, Julius Juma Murray, 51. He failed to make the required home visits and the agency falsified records to cover it up, according to the indictment issued last summer. Murray's lawyer, William Spade, said his client did his job and Andrea Kelly is right to accept the primary responsibility for Danieal's death. "He did what he was supposed to do," Spade said of Murray. "He made the visits he was supposed to make. He tried to get the girl services, and he wasn't successful because of the inaction of the parents." Officials from DHS and the Philadelphia District Attorney's office did not respond to requests for comment yesterday evening. Danieal Kelly's father, Daniel Kelly, has been charged with endangering the welfare of children. Also charged in the case were Multi-Ethnic's founder and two former DHS case workers. Hark said Andrea Kelly's plea agreement does not address whether she will cooperate in any of the other cases. If she had gone to trial, Hark said, Kelly might have been convicted of first-degree murder and sent to prison for life. He said any jury would have been moved by the details of the girl's death, and the pictures of Danieal's body. "If you have complex issues of an extremely malnourished mentally and medically disabled child in a mother's care, it will really affect the jury," he said. The plea hearing is set for 1:30 p.m. before Common Pleas Court Judge Benjamin Lerner. Along with the murder plea, Kelly is also pleading guilty to child endangerment. "It's the appropriate thing to do to bring closure to a very unfortunate circumstance in her life, and her family's life," Hark said. From the ABC Web site for "The adventures of an incurable optimist:"
Michael J. Fox, the former star of ABC's comedy hit Spin City, makes an emotional return to the network as the acclaimed television and movie star investigates the nature of optimism. 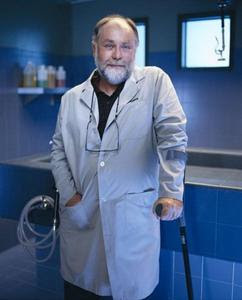 In 1998 Fox publicly revealed that he had been diagnosed with early onset Parkinson's disease and, two years later, made the difficult decision to walk away from a highly successful acting career with credits including the top-rated NBC comedy series Family Ties and the blockbuster Back to the Future movies. His triumphant spirit and positive attitude, considering his daily fight against the symptoms of a complex and incurable neurological syndrome, may make you wonder: How does he remain an "incurable optimist"? Fox travels across the globe to explore the enduring strength of hope. He talks to both famous and everyday people, venturing everywhere from the Far East to President Barack Obama's inspiring inauguration -- all for a one-hour special, Michael J. Fox: Adventures of an Incurable Optimist, airing THURSDAY, MAY 7 (10:02-11:00 p.m., ET) on the ABC Television Network. The whole world, shaken by economic woes, is taking a closer look at optimism. Imagine a country which measures its success with a figure for "Gross National Happiness" instead of Gross National Product. Fox visits the secluded Himalayan nation of Bhutan, a modern day Shangri La that stresses the importance of joy in everything it does. Can happiness actually be legislated? Fox is fascinated by this nation's commitment to the positive well-being of its citizens. "The same joyous spark that Michael J. Fox shared with us during his acting career shines through in this compelling look at the transformational power of optimism," said Victoria Dummer, co-head and senior vice president, Alternative Series, Specials and Late Night, ABC Entertainment Group. During this entertaining and inspiring hour, Fox also meets doctors and scientists who share lively insight on the cutting edge science that's helping us better understand the nature of optimism in all of us. He introduces viewers to a variety of people who haven't let difficulties stand in the way of their happiness. Even Fox himself says the past 10 years, dealing with Parkinson's and setting up The Michael J. Fox Foundation, have become among his happiest and his best. "For everything this disease has taken, something with greater value has been given," Fox says, "So, sure, it may be one step forward and two steps back, but after a time with Parkinson's, I've learned that what is important is making that one step count." Fox is still an actor, but his personal and professional focus has now shifted to Parkinson's disease. He's revolutionized research in the field with The Michael J. Fox Foundation, the world's largest non-profit funder of Parkinson's research. He is also a best-selling author. His first book, Lucky Man, was published in 2002. 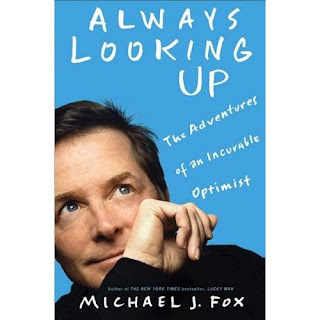 A new memoir of the last eight years, Always Looking Up, (pictured) was out on March 31. Both books are from Hyperion. Michael J. Fox, Nelle Fortenberry and Rudy Bednar are executive producers of Michael J. Fox: Adventures of an Incurable Optimist, a collaboration between Northern Fox Productions and Lincoln Square Productions. Nearly 15 years after becoming disabled in a shooting incident, Patrick Rhoden (pictured) is still determined not to live under the cloud of invalidity. Instead, he has set about repairing and even donating wheelchairs to other physically disabled persons and has continued to be an inspiration to many since being injured. Rhoden's home in Gutters, St Catherine, is the centre of his labour of love. 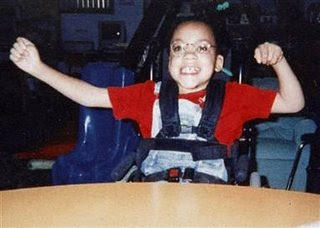 The wheelchair-maker said he sustained his disability when he was shot in his back on January 18, 1995. Rhoden, who is paralysed from his waist down, said his will to survive has inspired him to channel his energy positively. "When I started to fix the wheelchairs, it (business) was very slow. Then persons heard about it and now this is the result,'' the 39-year-old said, pointing to numerous wheelchairs under repair. He told The Gleaner that his efforts have given hope to many persons who often feel like giving up because of physical disability. He has even counselled individuals who have expressed hopelessness, anger and fear. "Persons who suffer disabilities will get weak sometimes and will feel like giving up. However, if they get support and know someone cares, it will give them hope. "They can be productive individuals and that inspires me to continue preparing what makes them independently mobile,'' remarked Rhoden. 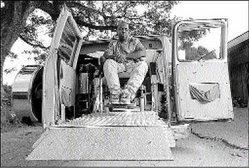 Rhoden even retrofitted his GMC truck to move his motorised wheelchair independently. Though he is subsisting from his talent, he thanks the charity Food For the Poor for helping him to source the parts as it would have been difficult without their assistance. Groups for the disabled in Malawi are pushing for legislation to protect them from stigmatization and discrimination. Leading the fight is the Federation of Disability Organizations in Malawi (FEDOMA), which brings together several such groups. Executive Director Mussa Chiwaula says the disabled are hurt by the absence of an equal opportunity law to protect them. "For instance, when people are putting up some buildings, they don't follow the required standards. They just build anyhow because of there is no law that can be enforced to ensure that the structures are user friendly," he says. Chiwaula also says there are no laws in the education system to protect disabled children. "But if there [were] a law, it means it becomes unlawful for any educational institution to refuse [education] any child with disability. And anybody who refuses that person [could be prosecuted]," he says. NGOs have pressured the Malawi government to endorse equal opportunity policies for the disabled. They encourage equal participation of all Malawians in all sectors of life -- including social, political, economic and cultural activities. But Chiwaula says a policy without back-up legislation is meaningless. He says his organization has intensified efforts for the speedy enactment of the legislation, at least by the end of the year. AUSTIN – Efforts to start consolidating state schools for the mentally disabled in favor of community-based services crumbled April 28 as lawmakers in both chambers agreed they would be unable to pass such sweeping legislation. Though House and Senate committees moved forward with a bill to dramatically reduce waiting lists for services in the community and to let people with disabilities choose how they receive care, the measure was stripped of anything contentious. All references to state school closure or consolidation were removed, as was a provision that would have ended state school admissions of people under 22. Downsizing private institutions for the disabled is also off the table. The reform legislation follows a U.S. Department of Justice report last year that found abuse, neglect and widespread civil rights violations inside Texas' 13 institutions for the disabled. In February, allegations that employees at the Corpus Christi State School forced residents into a late-night "fight club" added fuel to the fire to downsize the state schools. Advocates for the disabled have argued that the state schools are dangerous and inefficient, and that community care is safer and more cost-effective. Longtime state school families have fought back, saying community care is unregulated and unsafe, and that many people have disabilities too profound to live at home or in group homes. Lawmakers who support closing some state schools could still try to add amendments to the reform bill, which calls for a strategic plan for state disability services that cuts the wait time for community-based care down to two years. But they say opposition from their colleagues with state schools in their districts is so intense that anything that hints of a downsizing is unlikely to pass. "There will be no change from the status quo," said Sen. Eliot Shapleigh, D-El Paso. "We continue to understaff and underfund this system. We need real reform from statewide leaders... and that has not happened." Opponents of closure or consolidation say the current reform bill, plus a state school safety bill that has passed the Senate and is awaiting a vote in the House; do enough to address problems in the care system. They say the state schools are effective and serve an important purpose, and that closing any of them would be disastrous. Though the movement to close or consolidate state schools started in the House, the Senate has seemed more receptive. On Tuesday, after endorsing the "reform-lite" state school plan, the Senate Health and Human Services Committee added a disability services advisory board to the bill. The board could eventually consider consolidation issues. WASHINGTON — The Supreme Court heard arguments on April 28 about what parents must do to get taxpayers to pay for a disabled child’s special education at a private school. With some specified exceptions, the Individuals With Disabilities Education Act, as amended in 1997, allows parents to receive reimbursement for a special education student’s private school tuition only if the child has previously received publicly financed special education services. In Tuesday’s case, Forest Grove School District v. T.A., No.08-305, an Oregon school tested a child, referred to as T.A., and determined that he did not have a learning disability. His parents then sought a diagnosis elsewhere and were told he had attention deficit hyperactivity disorder. During the oral argument, Justice John Paul Stevens suggested that an inability to force the school district to pay for private programs after it refused to find that a child had a learning disability might “create an incentive for the school board” to refuse to provide special education. propose an individual education plan for the student within the public system, parents give the plan a chance — often just for 10 days — before heading off to private programs. David B. Salmons, the lawyer arguing the case on behalf of the parents, countered by saying the situation was rarely that simple. The individual education plans are usually devised at the end of a school year for the following year, and parents often need to reserve places well ahead of time in private programs. “If you wait until the school year has already started, those may not be available,” Mr. Salmons said. When most students apply to college they think about what dorm they want to live in and the fact that they won’t be living at home. They usually don’t have to worry about whether they can get to their rooms, much less their classrooms. But for students who have physical disabilities, that is just one of the many things they have to think about when going to college. Junior Lukas Bratcher was born with Amyoplasia Arthrogryposis Multiplex Congenita, a non-genetic birth condition. It causes stiffness in his joints, underdeveloped muscles, and some muscles never formed. Most students don’t even think about things like getting out of bed or taking a shower that could be considered difficult for other people. For Bratcher, it limited where he could live on campus. “There’s a handicapped room in Boppell, but the shower was too small,” said Bratcher, who is confined to a power chair. He currently lives in Duvall, the only dorm with an elevator. This year Bratcher has three men who work for him: a friend from high school, who is his roommate, and two people who live in the room next door. All three of them help him with personal care, including everyday tasks such as getting out of bed, going to the bathroom and getting dressed. Bratcher didn’t have too many difficulties adjusting to living on campus since he has dealt with the disease all his life. However, there were some things that were a challenge in terms of academics. Bratcher also has a hard time getting into Lindaman because there isn’t an automatic door. The other place on campus that has been most difficult for him is the Robinson Teaching Theatre. Fire codes didn’t allow him to set up a table in the back to take notes, so he tried sitting in the back and listening, then getting notes from other people, as well as getting audio of the lectures, but his academics suffered. Then he tried sitting in the front with a table, which allowed him to take notes, even though he couldn’t see the PowerPoints as well. Bratcher took Core 250 over the summer, when it was held in a different room. Andrew Pyrc, assistant director of Career Services, has helped make Bratcher’s experience at Whitworth easier. When Bratcher has a class in a room he can’t get to or can’t take notes in, Pyrc moves it to a place Bratcher has access to or gets facilities services to bring in a table. Before freshman Amanda Hughes, who is blind, (pictured) came to Whitworth, she met with an orientation and mobility instructor from the Department of Services for the Blind who helped her learn her way to her classrooms. 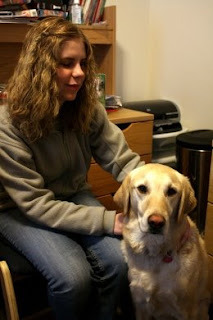 Hughes has a guide dog to help her around, but she usually walks with people who have class in the same building. Pyrc has to make sure all disabled students are accommodated for, but that is becoming more difficult as the student body grows. Because there are more students it makes changing classrooms for accessibility more difficult. “There’s not a lot of wiggle room due to enrollment growing,” he said. When Bratcher was applying to schools he was required by his high school to apply to five universities. Bratcher said that’s always how he looks at things: he doesn’t let his disability get in the way of doing something. Hughes also didn’t worry about accommodations when she applied. She knew that she wanted to go to a smaller school. “I need my professors to know I’m there, I need them to notice me,” Hughes said. According to the Americans with Disabilities Act (ADA), schools aren’t allowed to ask whether students applying have a disability. Whitworth asks that students contact the school regarding accommodations at least six to eight weeks before school starts, according to the catalog. Their disability must be documented by a licensed professional, something that may be required in all schools in the state of Washington, according to the Educational Support Services on the Whitworth Web site. Once a student self-identifies as disabled, Pyrc figures out what accommodations he/she may need. “We talk about what the student needs to be successful,” Pyrc said. Usually they will talk about what worked in high school so it’s easier to get an idea of how to meet their needs, Pyrc said. Sometimes Pyrc will let specific faculty know about students and their disabilities if the student wants faculty to know ahead of time. Often times students might need accommodations in one class but not another, so Pyrc helps them on a need-by-need basis. Some students who are hard of hearing may need to use an amplification device that allows them to hear the teacher’s voice better, Pyrc said. Devices in the library for visually-impaired students allow them to magnify reading material, and a special computer with software allows students who are blind to use voice commands. Whitworth also has a membership with the lending library so Pyrc can borrow digital recordings of things students need as they need them. Pyrc orders all of Hughes’ books as digital recordings so that she can listen to them. There is also an organization that scans the pages of textbooks and put them on a CD if blind students are unable to get a digital recording, Hughes said.Hughes said that even though she is blind she doesn’t think her college experience is better or worse than other college student’s experiences. “The only thing different about me is that I can’t see, but I make up for it in other ways,” Hughes said. NEW YORK -- A class that teaches teenagers with autism the ins and outs of social etiquette appears to help them build social skills and stronger friendships, a small study finds. Researchers at the University of California Los Angeles found that a 12-week class they developed -- dubbed PEERS -- was able to boost the social skills of teenagers with milder forms of autism spectrum disorders (ASD). ASD refers to a group of developmental disorders that hinder people's ability to communicate and build relationships. The conditions range from severe cases of "classic" autism to Asperger's syndrome -- a disorder in which a person has normal intelligence and verbal skills, but difficulty socializing and understanding subtler forms of communication, like body language and vocal tone. The current study, appearing in the Journal of Autism and Developmental Disorders, included 33 12- to 17-year-olds who had been diagnosed with either Asperger's or "high-functioning" autism. The teenagers attended 12 weekly classes where they learned skills such as how to pick the right peer group, join in conversations, be a good "host" for get-togethers and handle teasing or arguments. Parents attended separate classes where they learned how to support their child's social development. "It's hard enough to be a teenager," lead researcher Elizabeth Laugeson said in a UCLA news release, "but it's harder still for adolescents with autism because they typically lack the ability to pick up on all the social cues most of us take for granted -- things like body language, hand gestures and facial expressions, along with speech inflections like warmth, sarcasm or hostility." The classes her team developed, she said, break social skills down into small steps, allowing teens with ASD to learn specific actions they can take in response to different social situations. "So if they are teased, for example," Laugeson explained, "we teach them to give a short comeback -- like saying 'whatever' or 'so what?' They learn not to take the bait." At the end of the study, the researchers found, parents reported improvements in their children's social skills, and the teenagers were having more interaction with their friends outside of school -- including playing host to more get-togethers. "For me," Laugeson said, "the most important outcome of this research is that we're able to have a direct impact on the quality of lives for teenagers with ASD. Helping them to develop meaningful relationships and feel more comfortable within their social world -- these are essential ingredients to living a happy life, and what could be more important than that?" BEIJING -- Beijing is expanding its mental health facilities in order to treat the growing number of people suffering psychiatric illnesses. The Municipal Health Bureau issued a statement April 26, saying that more hospitals would be required to set up psychiatric departments. The city has 6,900 psychiatric beds in 32 hospitals and clinics, but the number of people with serious mental illness is estimated at 150,000. Six large comprehensive or special hospitals, in the first round of the campaign, will set up psychiatric departments under the guidance of three existing mental hospitals, the bureau decided at a meeting on April 17. From this year, more large hospitals will be able to diagnose and treat depression and compulsive disorders, and counsel terminal cancer patients, said bureau spokesperson Deng Xiaohong. According to the Mental Health Center under the Chinese Center for Disease Control and Prevention, China has more than 100 million people with mental illness, but less than 5 percent of them are aware of their conditions, and even fewer go to hospital for assessment. Mental illness is top of China's burden of disease rating carried out by the World Health Organization, surpassing cardio-cerebral vascular diseases, respiratory diseases and malignant tumors. Mental illness accounts for 20 percent of all ailments and injury-led disabilities in China. The figure is expected to reach 25 percent by 2020. Experts say that with the promotion of treatment, more people will admit, discover and have their mental illness treated promptly. A Baltimore man accused of conspiring to have a mentally disabled man killed for life insurance money - and who told detectives he had become a beneficiary on the life insurance policies of other disabled individuals - was working as a caretaker at a Howard County group home at the time of his arrest, The Baltimore Sun has learned. Kevin Jerome Pushia (pictured) was an overnight caretaker at a Columbia group home for 13 years, working on weekends to help supervise three developmentally disabled adults, the head of the company that operates the home confirmed April 27. David Coughlin, executive director of Hunt Valley-based Richcroft Inc., said that after learning of Pushia's arrest, he and another employee conducted "risk assessments" April 27 of the men who have been under Pushia's care. Coughlin said he talked with other staff about Pushia's behavior and concluded that the residents are not in danger. He said he has not contacted police about Pushia's work for his company. "We were satisfied that nothing was [happening] that could put any of our people at risk," Coughlin told The Sun. group home run by the Arc of Baltimore, where Pushia was employed for four months. Wallace's body was found Feb. 4 in Baltimore's Leakin Park. He had been shot, police said. Charging documents say that Pushia, who once led a small East Baltimore church, confessed to taking out multiple life insurance policies on Wallace and paying $50,000 in church funds to have him killed.Clea, who lives in the Baltimore area, was arrested Saturday at a South Carolina hotel while attending a religious conference. Pushia told detectives that Clea put him in touch with an unidentified hit man, according to a warrant for Clea's arrest filed by Baltimore police. Clea, however, told officers that Pushia had said only that he wanted to hire someone to beat a person up to intimidate him, and that Clea facilitated that meeting, police said. Clea, who is on probation for assisting in the May 2007 armed robbery of a Wendy's restaurant where he was a manager, was being held in Orangeburg, S.C., pending an extradition hearing. Pushia did not make a scheduled appearance at a bail review hearing in District Court on Monday because of an undisclosed medical problem. Defense attorney Russell Neverdon said he did not know what medical issue prevented Pushia from appearing. On Saturday, Neverdon said he visited with Pushia and found him despondent, withdrawn and depressed. He reasserted his client's contention that a murderer remains at large. "As far as [Pushia] being the mastermind, that's yet to be determined," Neverdon said. A spokeswoman for the Maryland Department of Human Resources confirmed April 27 that Pushia has served as a foster parent in the state, working through a private agency. Nancy Lineman, the spokeswoman, said two children were removed from his care in recent weeks, before his arrest. Pushia, who signed his checks "Dr. Kevin Pushia," also owned several properties, court records show. He also bought a new townhouse in the city's Frankford neighborhood which is titled to his now-defunct church. Coughlin, of Richcroft, said Pushia was an "unremarkable" employee who had not displayed any serious problems at work. "He was considered soft-spoken, quiet," Coughlin said. "He worked the 11 p.m. to 7 a.m. [shift]; we didn't see him very often. He worked with the same group of guys for all 13 years." ADAPT's Action Report. Many pictures from the protest are on the ADAPT Action Report page. Ninety-one ADAPT activists were arrested April 27, many chained and handcuffed to the front White House fence, showing their anger at the Obama Administration’s failure to include long-term services and supports in health care reform. 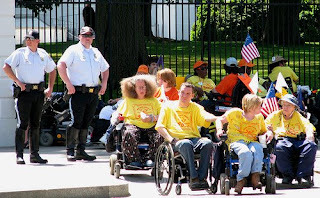 Ten ADAPT members met with Counselor to the President and Director of the White House Office of Health Reform, Nancy-Ann DeParle, earlier in the day and were angered that the Obama Administration was not supporting change. not get the services they need to remain in the community and in the workforce. Bruce Darling and Dawn Russell attended the meeting for ADAPT along with Randy Alexander, Linda Anthony, Rahnee Patrick, Bob Liston, Karl Woolsey, Bobbi Wallach, Frank Lozano and John Gladstone. Also attending this meeting were Jeff Crowley, Director of Office of National AIDS Policy and an advisor on the administration’s development of disability policies; Henry Claypool, Director of the Office of Disability in Health and Human Services (HHS); and Mike Hash, coordinator of the HHS-White House reform efforts. ADAPT is in Washington DC to get the message across to lawmakers that the CCA is not just Medicaid reform, but it is also completing an unfulfilled promise of the 1990 Americans with Disabilities Act. This year marks ten years since the US Supreme Court declared that inappropriate institutionalization is discrimination; a unique discrimination that applies to people with disabilities. However, in every US state there are still Americans who do not wish to live in an institution, but there are no services and supports to allow them to remain at home, with family or in the workforce. While the group of ten met with the Administration, 500 activists held vigil outside chanting and holding signs and banners. At 11 a.m. Johnny Crescendo gave the group a respite from their chants as he sang and played guitar using a PA system in the middle of the street. Tourist groups in their uniform T-shirts mixed with the multi-color ADAPT at the popular tourist destination. fence; but once the news of the duplicity of the Obama Administration reached the crowd, the object was clear. Ultimately, 91 activists were arrested. They were given a summons at the scene and released. Across the street in Lafayette Park, ADAPT activists watched the arrests and cheered on their compatriots. Hall, who is a double amputee, is National Chair of the PWD Tri-Union Committee for I AM PWD, which works to include more people with disabilities in the performing arts and entertainment media. In addition to his role on "CSI," he has had television guest-starring roles on "West Wing," "Brooklyn South," "Touched By An Angel," "Promised Land," "Love & War" and "Highway to Heaven," and recurring roles on "L.A. Law," "Family Law," "The Practice," "High Incident" and "Life Goes On." He also appeared in the role of Samson in the TNT Emmy-winning mini-series "Andersonville," directed by John Frankenheimer. "Over one-third of PWDs report that a reasonable accommodation would help them in their work, but nearly two-thirds never asked for an accommodation because they believed employers would be reluctant to hire them," according to I AM PWD. "Many performers are unwilling to be candid about their disability for fear of being viewed as an object of pity and incapable of doing the job." From ABC News at 2:09 p.m. April 27. For more pictures of the ADAPT protest, go here. You can also follow the protest on the ADAPT Action Alerts page and Twitter. Police have started to arrest some of the disabled protesters picketing outside the White House right now. Almost all of the 400 demonstrators are in wheelchairs. "Shame on you, Obama is a liar! Shame on you, Obama is a liar!" some are chanting. community-based attendant services instead of just for nursing homes. "The President supports CCA and was in fact a co-sponsor of it when he was in the Senate," says the administration's spokesperson for health reform, Linda Douglass. "He hasn't signed it into law because there is nothing to sign yet. It was introduced at the beginning of the year and has been referred to the Energy and Commerce Committee." "Take me inside with you right now and I'll call Obama a f------ liar to his face," says Peggy Dougherty, 69, from Easton, Penn, who has handcuffed herself to the White House gate. Dougherty, who suffers from multiple sclerosis, has an Obama/Biden pin on her purse. She voted for the Democratic ticket, she says. "He made a promise and he broke it," she says. including Ms. DeParle, has again demonstrated that they are unwilling to take leadership and capitalize on the promise of healthcare reform to pass CCA. ADAPT has been part of prior meetings with the Obama administration which also failed to yield any commitment to call for CCA to be part of healthcare reform." Continues the action alert: "In response to the Obama administration's refusal to demonstrate leadership, ADAPT activists have chained and handcuffed themselves to the Whitehouse fence. They are refusing to leave until President Obama fulfils his campaign commitment to support passage of the CCA. 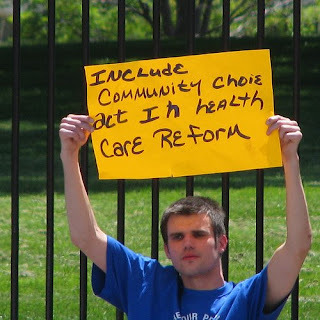 ADAPT is demanding that President Obama create the change that Americans with Disabilities need: the Community Choice Act!" "This is about choosing to live in our homes in our communities instead of nursing homes," says Milagros Franco, from the Brooklyn Center for Independence of the Disabled. A man in a wheelchair handed me two ADAPT fliers. "The squeaky wheel gets the grease," says one. Reads another: "You think prison is bad, trying living in a nursing home." * This post has been updated with newer information as to what DeParle told the activists from ADAPT. ** UPDATE: Harkin communications director Kate Cyrul emails us to say: "Discussions about what will and will not be in the health reform package are currently underway, and no final decisions have been made. Senator Harkin has made clear that any health care reform package is incomplete if it does not address the right of individuals with disabilities to choose to live in the community and receive supportive care, services they are currently entitled to only in an institutional setting. Senator Obama was a cosponsor of the Community Choice Act in the 110th Congress, and made support for the legislation a key part of his disabilities platform during the campaign."